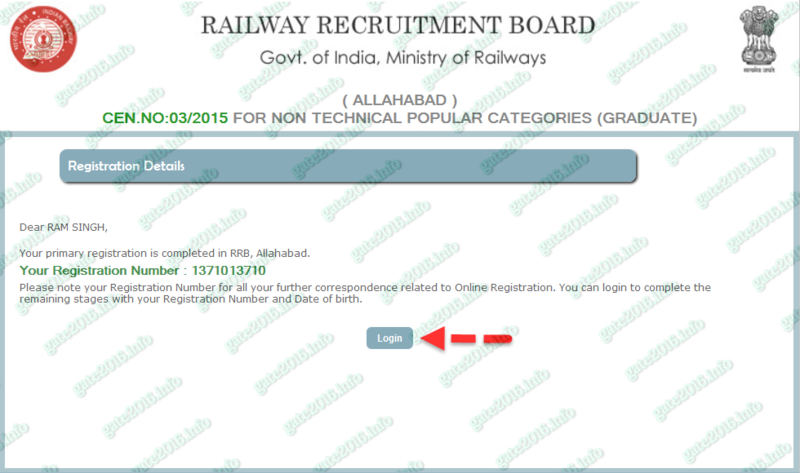 This is first stage of RRB CEN – 03/2015 Online Application form “Primary Stage“. Here candidate need to fill three kind of details. Candidates need to fill all 3 steps carefully one by one. 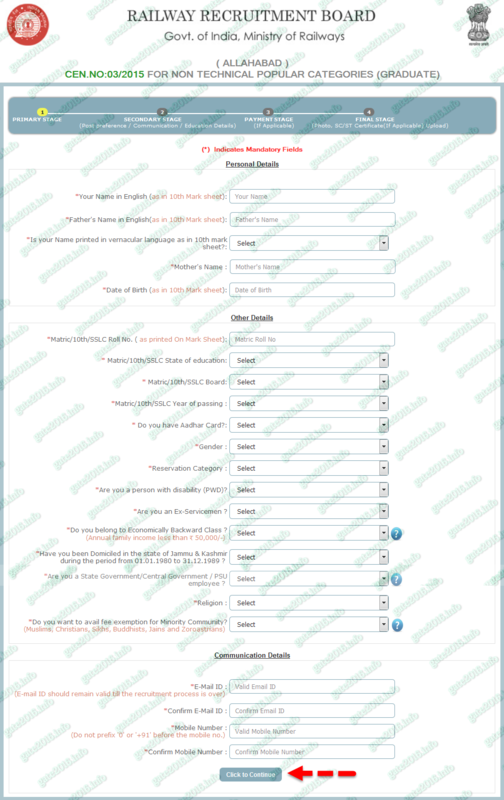 Candidates have to fill all details properly for this you need some documents related to you. What document you will require while filling RRB CEN – 03/2015 Online Application form is written above in LIST -1. 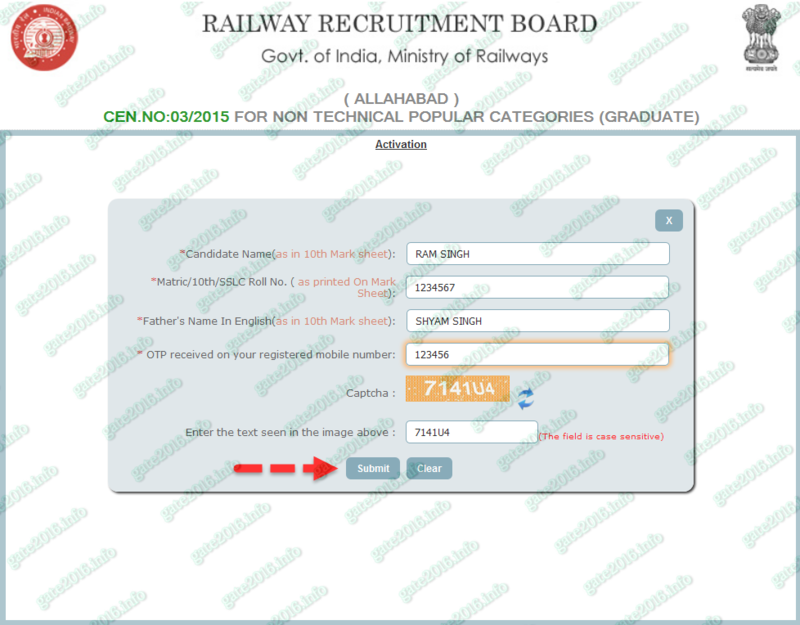 Candidates please refer this list to fill primary stage of RRB CEN – 03/2015 Online Application form. We have provided a sample filled “Primary Stage” of RRB CEN – 03/2015 Online Application form. Please refer Image-6. Sample filled “Primary Stage”, first stage of RRB CEN – 03/2015 Online Application form. When a candidate will click on “Click to continue” , will directed to next page as shown in image-7. Here you will see a summary chart of all the details which you have filled in “Primary Stage” of RRB CEN – 03/2015 Online Application form. Here candidate will find two check boxes. I have verify and conform all the details entered by me in the Primary Registration and want to submit the same. No. I want to change some details. If a candidate want to change anything which he/she entered in the “Primary Stage” of registration. He/she need to check mark second radio button and click on “Back to Details”. 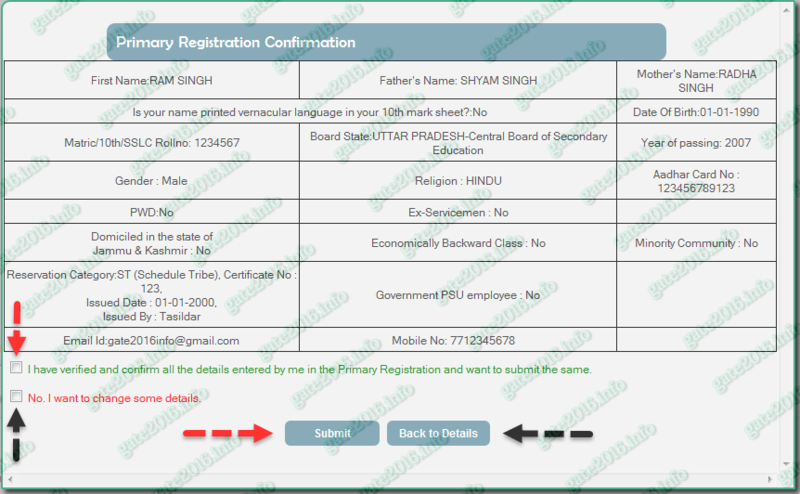 If you find that all the details filled by you in “Primary Stage” of registration is correct then you can proceed to next stage just by clicking on “Submit”. Remember once you click on “Submit” you will not be able to do any sort of change in “Primary Stage” of registration. So candidates be carefully before finally submitting “Primary Stage” of registration. Your primary registration details are accepted and an activation link has been sent to your registered email ID and an One Time Password (OTP) has been sent to your registered mobile number. Candidates can use any of the above mentioned two technique to proceed further. This would be first message which you will receive on your registered mobile number. When a candidate will click on “Activate with OTP” , will directed to next page as shown in image-9. 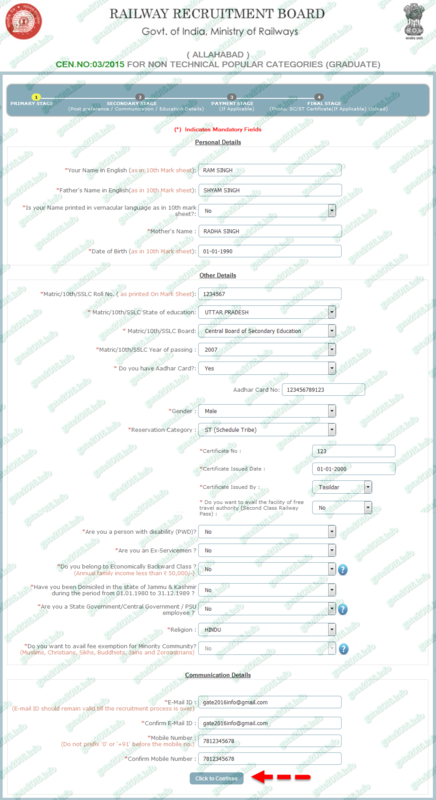 Here candidate need to fill four details which he/she have filled in previous steps. After filling these four details candidate need to fill appropriate captcha and the click on “submit”. This would be second message which you will receive on your registered mobile number. When a candidate will click on “Login” , will directed to next page as shown in image-11. Image-11 is placed on next page. Now click on “Secondary Stage” tab shown below. Now click on “Secondary Stage” tab shown below. If you fill your RRB CEN 03/2015 online application form properly then you need not to worry about it. 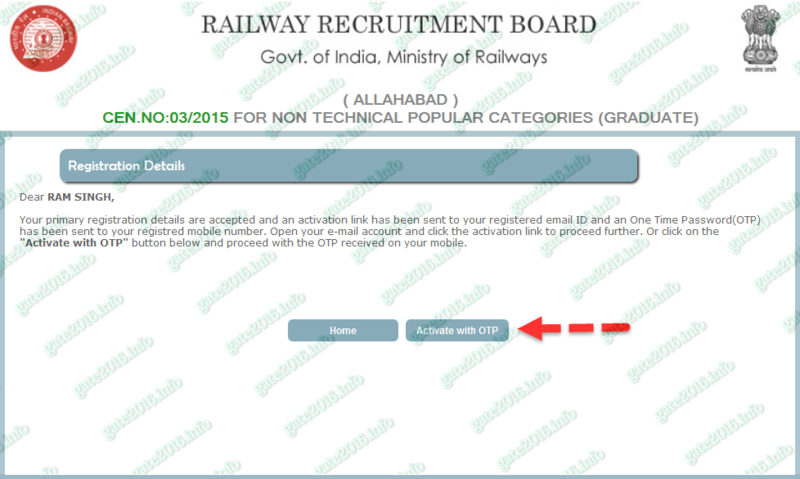 All RRB CEN 03/2015 online application forms are being checked carefully. If RRB office found any mistake in your form they will contact you.